Catherine Margaret Albert was born on 28 September 1884 at 371 South Pearl Street, Albany, Albany County, New York. She was the daughter of Joseph Albert and Eva Wink. Catherine Margaret Albert was nicknamed Kitty. She received First Holy Communion on 27 June 1897 Our Lady Help of Christians Church, 74 Second Avenue, Albany, Albany County, New York. She was confirmed on 30 April 1899 at Our Lady Help of Christians Church, 74 Second Avenue, Albany, Albany County, New York. As of 30 April 1899, Catherine Margaret Albert was also known as Katharina Margaretha. Catherine Margaret Albert left a will on 23 October 1966 at 509 3rd Street SE, Washington, District of Columbia. 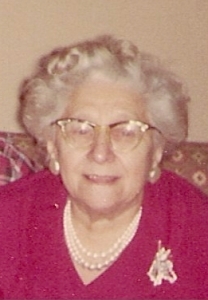 Catherine Margaret Albert died on 30 September 1984 at Arlington, Arlington County, Virginia, at age 100. She was buried in October 1984 at Mount Olivet Cemetery, 1300 Bladensburg Road NE, Washington, District of Columbia. [S84] Unknown short register title: entry for unknown spouses' names unknown repository, Fr. Maher, 12 Rosemont Street, Albany, Albany County, New York, Record # 7.